I wrote this some time ago, and figured I’d better get it out here before 2010. Data Shortcuts are Cool. The list of reasons to use these is growing. One such reason is a small amount of companies have shunned Vault for varying reasons, including the learning curve involved. I have repeatedly been tasked to produce methods that would allow the greatest flexibility in sharing, with the least amount of interruption to workflow. In earlier versions, Land XML had always been my preferred method of transfer, allowing some anonymity of the data origin. When the origin has been updated, the XML is overwritten and the definitions would recreate themselves like a data XREF, only more stable. In the past I have reserved certain procedures away from Data references, however since 2009 issued, these reservations are almost gone. Data shortcuts provide references to objects that can be inserted into other drawings. These references are like the best combination of a MAP queried object, LandXML data, and an XREF all in 1. They lie in the drawing, and distribute information, in the form of the original object, as an uneditable shell. Labels can be applied, and objects can be derived from the reference. 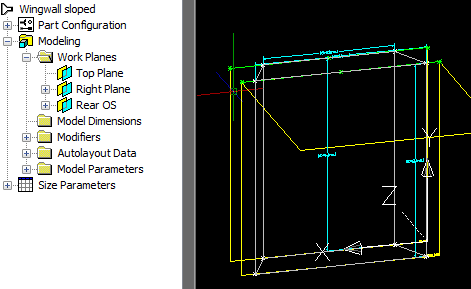 These limitation are that only surfaces, alignments, profiles, pipe networks, and view frame groups can be referenced. They provide a nice alternative to vault. The working folder encapsulates a work environment much like a Land Desktop project did, and will contain the shortcut information. It may include the related drawings and data shortcuts for a project. The Data Shortcuts node on the Prospector Tab shows the shortcuts in the current working folder. 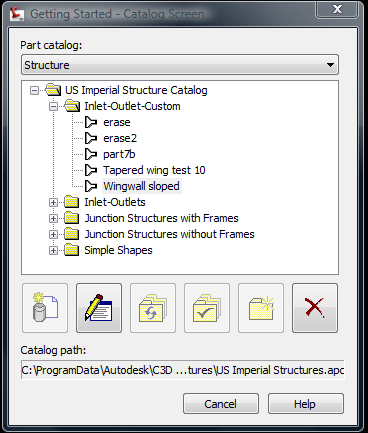 When an object is updated in the source drawing, notification appears in the main application window and in Toolspace Prospector. We will pick up where we left off from Part Builder Part 3. It’s time to speed things up a bit, so as I refer to procedures, I will once again detail them, and thereafter I will just state that it needs to be completed. Note: Halfway through I realized some changes needed to be made, in order for this process not to be more confusing than it might already appear. If I missed any odd things in the images, or got out of sync with the variable names, please notify me, and I’ll do my best to correct them. Today we continue from where we left off in Part Builder Part 1. Before we proceed, I’d like to note that a wing wall may not be everyone’s biggest desire. I needed it, and I felt that it would proved a fairly well rounded view of things. 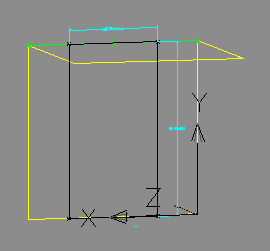 It needs equations, and gets worked laterally instead of vertically, which make it more of a challenge. Sitting on the axis of 2 different careers I can see this type of workflow from 2 different perspectives, and want to provide everyone with a bit more information that may have been unavailable. 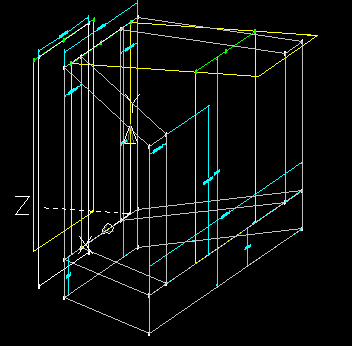 The 3D modelers understand the construction methods. What they need to understand is the limitations stopping them from working naturally through this process. 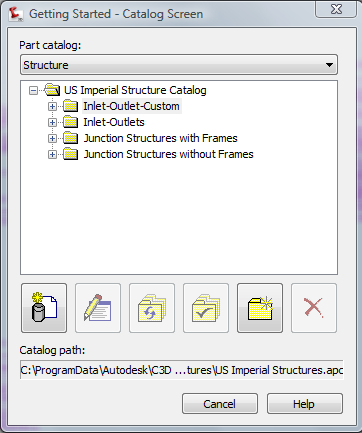 The Civil 3D techs know about odd application limitations, but need to understand how the construction methods, dependencies, and calculations work. If you don’t get something out of this session, it will be because you already had a good working knowledge of Part Builder, or you failed to post your questions here. 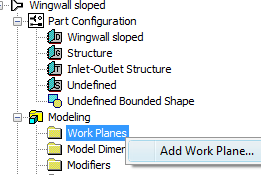 Create a Work Plane, Create Geometry, Add Dimensions, Add Constraints, Create Profile, Modify Dimensions, Create Modifier, and Configure Parameters. We will discuss the first six today. 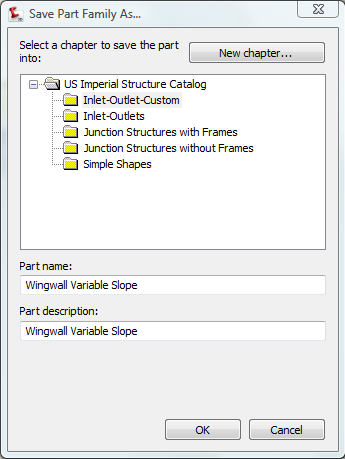 Open the part for the last session, named Wingwall Sloped. Let’s begin by creating the Top Work Plane. I always like to get my Top plane in first. Either I am working on it, or visually referencing it. 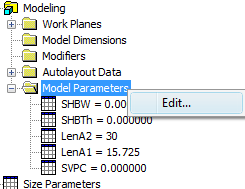 Part Builder is a functional parametric modeler that 90% of the industry steers clear of. If it is functional, then why stay away? The main reason is that Civil personnel are not modelers. Historically, that isn’t what they do. The road through Civil 3D is long and bumpy because it is a reactive dependent model in nature, not because the software is difficult. Civil personnel are not modelers, at least not until now. 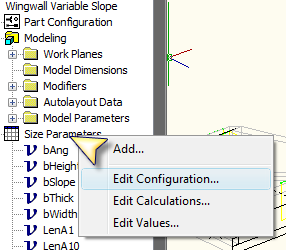 So why have a parametric modeling app in the middle of Civil 3D? Well, to quote one of my party chiefs, “To have and not need it better than to need and not have” (His motto was to carry everything in the truck…for ME to carry everything). Without the app, modified structures would be hopeless. We would be stuck with the same old OEM structures, and as new structures come out, they would not be accessible. 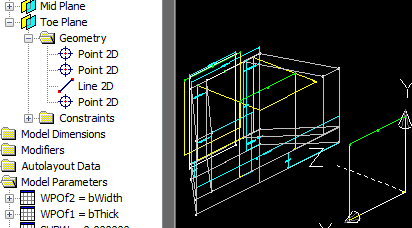 Eventually, everyone would use styled NULL structures for everything, reducing the effectiveness of Civil 3D as a 3 dimensional tool (You know, the object viewer is not just a toy). 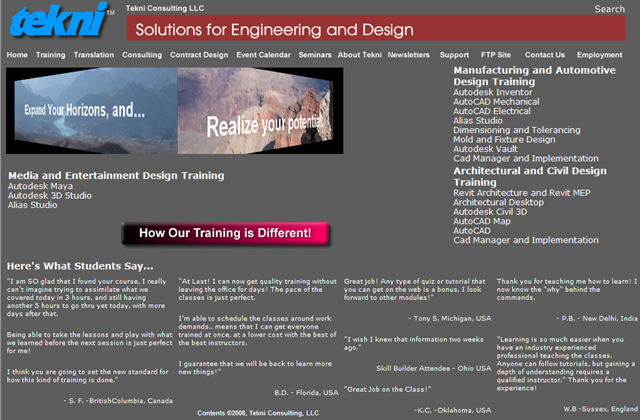 Pipe conflicts can be seen and evaluated easily……..IF the structures and pips are accurate.